Welcome to Dynamics 365 for Sales! The My Apps page shows the apps based on the logged in user's security role. The Sales Hub app is built on the Unified Interface framework. The Unified Interface framework uses responsive web design principles to provide an optimal viewing and interaction experience for any screen size, device, or orientation. With Dynamics 365 for Customer Engagement apps version 9.0.2, the Sales Hub app is optimized to work on mobile devices as well as desktops. The Sales app is designed for the legacy web client and is the full-featured, desktop-optimized web client app for sales scenarios. The Sales Professional app is similar to the Sales Hub app, but the entities included in the Sales Professional app are a subset of the entities included in the Sales Enterprise. For mobile devices, you'll also need to install Dynamics 365 for phones and tablets. 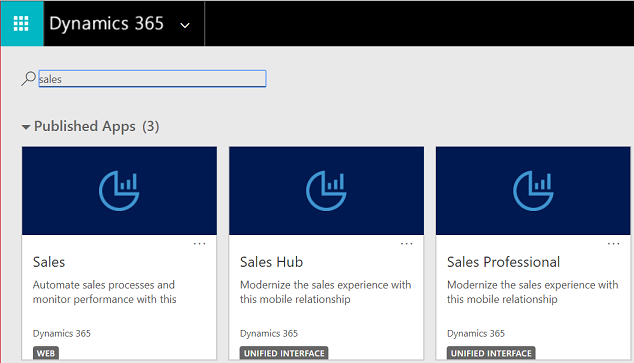 The following image shows the menu of the Sales Hub app, which is the Unified Interface app for Dynamics 365 for Sales. The following image shows the menu for the Sales app or the Sales module in the Dynamics 365 - custom app. Dynamics 365 for Sales offers great benefits, whether you're using a desktop, phone, or tablet. Follow guided business processes, so you know which steps to take next to close deals faster. You can tailor these business processes for your organization's needs. Manage customers and deals wherever you are, on any device (phone, tablet, PC, or Mac). Use SharePoint to store and view documents like presentations or notes in the context of a record, such as an opportunity, so anyone working on the opportunity can view them. Open sales data in Excel, make changes, and save the changes back to Dynamics 365 for Sales—all without switching between applications. Get actionable insights and suggestions based on how you work. For example, if you have an opportunity closing next week, the Relationship Assistant will send you a reminder to connect with your customer. Find all activities (appointments, phone calls, and so on) related to a customer or opportunity in one central place, so you have the context you need to do your job. Accelerate your team's performance by using real-time analytics based on historical data and predictive information. Monitor results, and provide feedback and coaching, in real time. 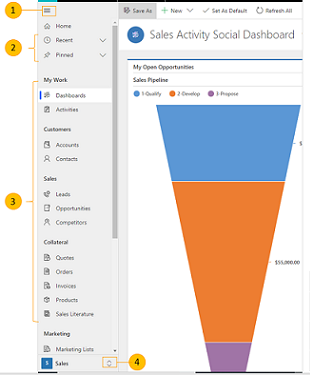 Use immersive Excel and prebuilt templates to do quick analysis without leaving Dynamics 365 for Sales.